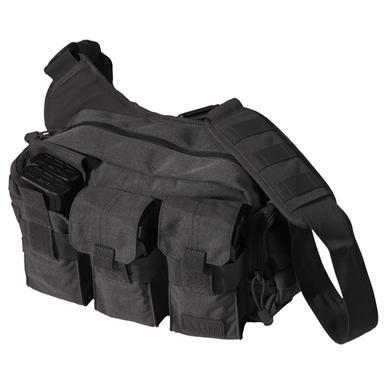 5.11 Tactical® Bail Out Bag delivers plenty of space in a compact, easy - access pack! Designed for Active Shooter Response Teams, the 5.11 Bail Out Bag packs wicked-tough 1,050-denier nylon construction and extreme versatility. Wears compact and close to the body for easy deployment from a vehicle. Easy access to all compartments when seconds count. The Front Mag pockets hold up to 6 AR magazines. Side utility pocket designed with web platforms for attaching added gear. A variety of features matched with practical design, the Bail Out Bag is sure to deliver on its name! Main compartment: 8 1/2"h. x 12"l. x 4 1/2"d. (459 cu. in.) Right and left side pocket: 6 1/4"h. x 4 1/2"l. x 1 3/4"d. (49 cu. in.) over 557 cu. in. total.